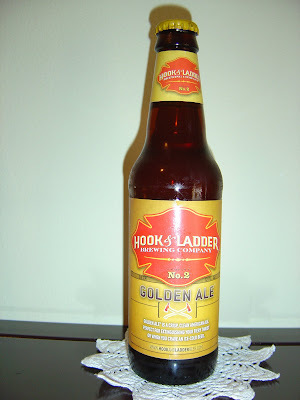 This afternoon I'm drinking Hook & Ladder Golden Ale brewed by Hook & Ladder Brewing Company in Rochester, New York. According to the label, this beer is "perfect for extinguishing your fiery thirst". And it's always worth a mention that these guys donate money to burn foundations for each barrel they sell. Light caramel malty aroma, not too much there. There is a nice light caramel flavor to start. Those flavors, coupled with some bread and toasty flavors, are pretty much the entire profile. If you use your giant imagination, you may taste some cinnamon way off on the horizon, too. A little thin and boring, and I feel this would have been better with a bigger carbonation dose. Also, this beer was a little too much on the sweet side to be considered refreshing or quenching. Decent flavors but misses the mark on a bunch of fronts.